Kiton trousers in tropical wool-cashmere blend. Straight leg tapers to ankle. Concealed button/zip front; belt loops. 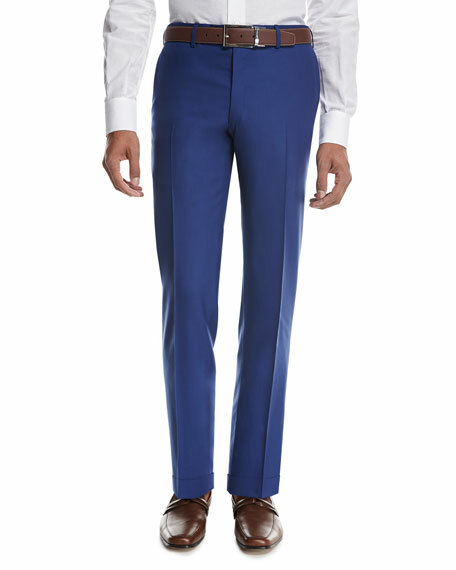 EXCLUSIVELY AT NEIMAN MARCUS Ermenegildo Zegna flat-front dress trousers with adjustable belt. Concealed tab/zip front; belt loops. Side slip pockets; back button-welt pockets. Cotton. Dry clean. Imported. Model's measurements: Height, 6'1"/185cm, waist 31"/79cm, suit 40, shirt 15.5x35, inseam 32"/81cm. Lanvin trousers with contrast woven knee-patch. Side slash pockets; back button-welt pockets. Slim, straight legs. Banded button-tab front; zip fly. Lanvin trousers with contrast woven knee-patch. Side slash pockets; back button-welt pockets. Slim, straight legs. Banded button-tab front; zip fly. Virgin wool; nylon/cotton trim. Viscose/acetate lining. Made in Italy. 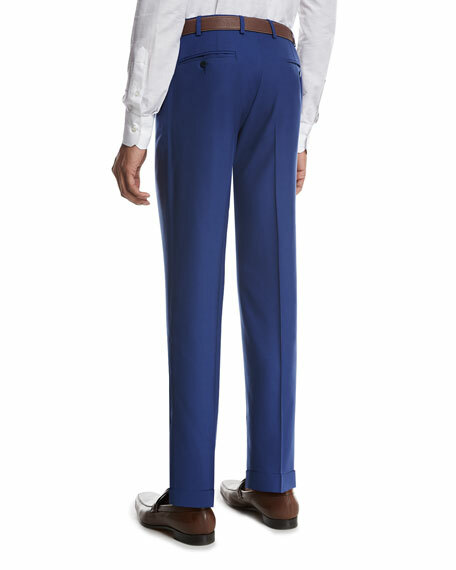 Peter Millar Crown Sport "Charlotte" trousers in lightweight mélange performance twill. Two-way mechanical stretch and moisture-wicking finish. Top quarter pockets; back button-welt pockets. Tailored fit through straight legs. Polyester. Golf. Machine wash. Imported. Model's measurements: Height 6'1"/185cm, waist 32"/81cm, typically wears size M.
Peter Millar "Excursionist" pants in flex design poplin. Five-pocket style. Slim fit through straight legs. Button/zip fly; belt loops. Cotton/silk/spandex. 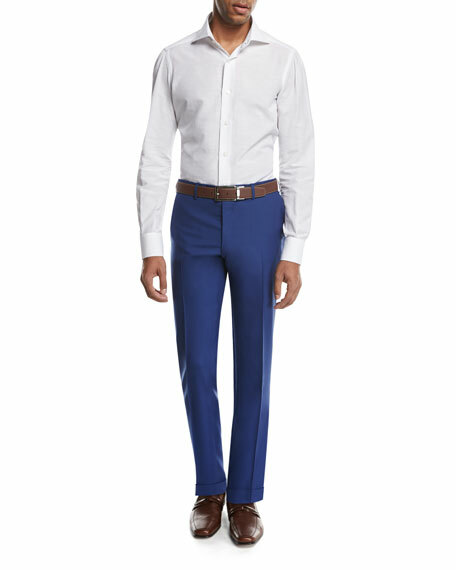 Peter Millar "Excursionist" pants in flex design poplin. Five-pocket style. Slim fit through straight legs. Button/zip fly; belt loops. Cotton/silk/spandex. Machine wash cold. Imported.